Series of community meetings lead to nomination of 16-17th Street block as most important commercial, pedestrian, and cyclist connector. Extended project to include 15th19th Streets. Begin design process with multiple agencies, key stakeholders. Project is partnered with concurrent paving projects as recommended by Complete Streets Policy. 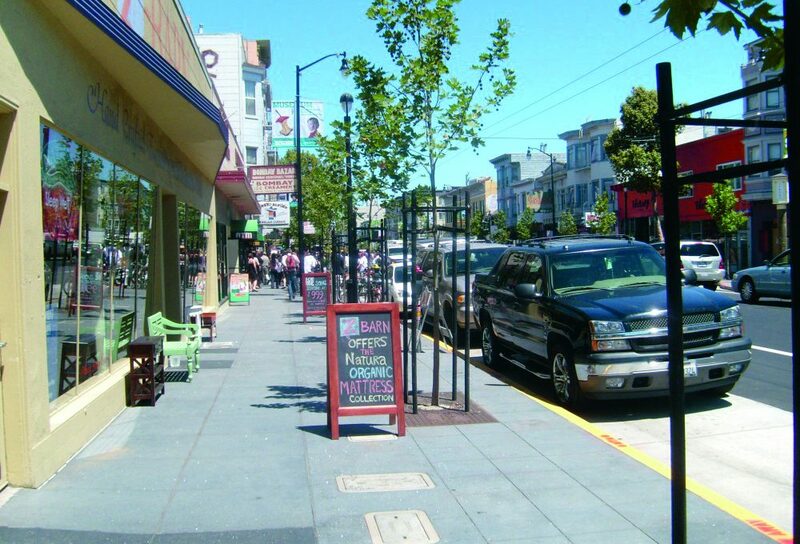 Valencia Street is an active, highly populated corridor in the diverse “Mission” neighbourhood of San Francisco. Many shops, restaurants, and art galleries line the street and are heavily used by the residents and visitors. 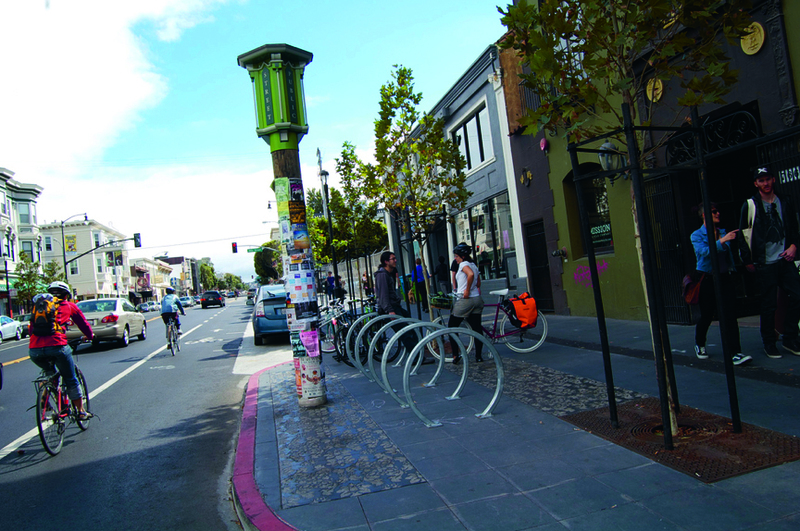 Cyclists frequently use Valencia Street and several bus routes traverse the corridor. 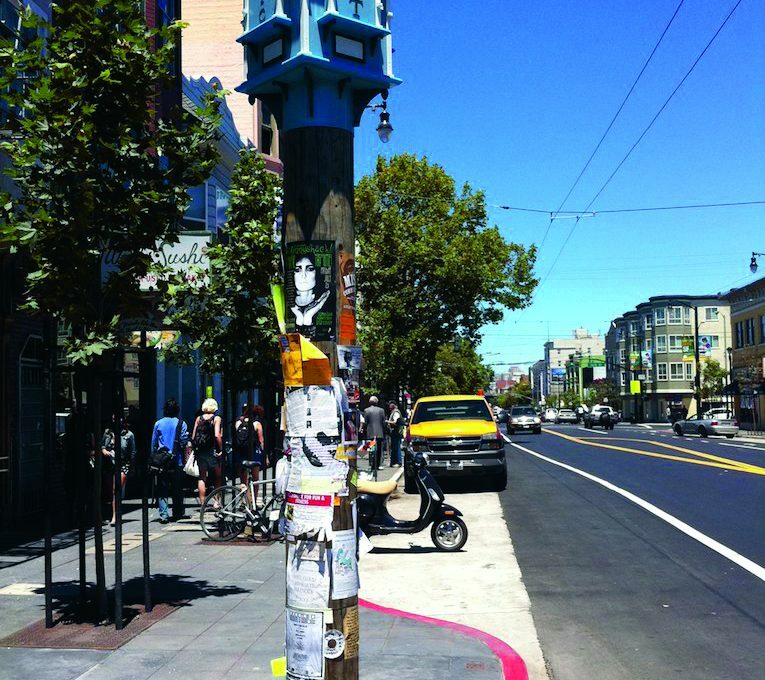 One block away from the project site is a transit stop that serves the entire Bay Area region. 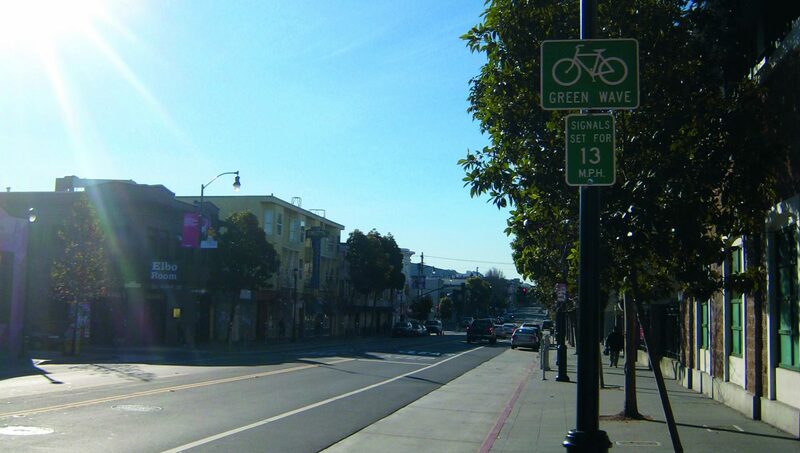 The 4-block corridor of Valencia Street had history of conficts between cyclists, autos, and pedestrians. It is a major cycling thoroughfare, a popular commercial area, and a hub for local and regional transit connections. Traffc moved too fast on the streets; buses blocked cars and cyclists. The sidewalks were overcrowded with people and parked bicycles. The ground level of the street was so congested, merchants had little opportunity to claim space for outside seating. The bottom line was that cyclists and pedestrians needed more space and the cars needed to slow down. The Great Streets Program put together an interagency team of experts with their own program, MTA’s Parking and Traffc Department, and the Department of City Planning. Collectively, their goals prioritized safety for all users, increasing sidewalk space, improving bicycle lanes, and maintaining the diversity of the neighbourhood. YOU HAVE TO TAKE SOME CHANGES, OR THINGS WILL STAY THE SAME FOREVER. Obtaining balance. The interagency team worked very well together. They had the right people around the table whose skills and experience were balanced. The team saw the vision and felt optimistic about the results. Within the project itself, balancing the goals of the community with technical merit ensured its success. 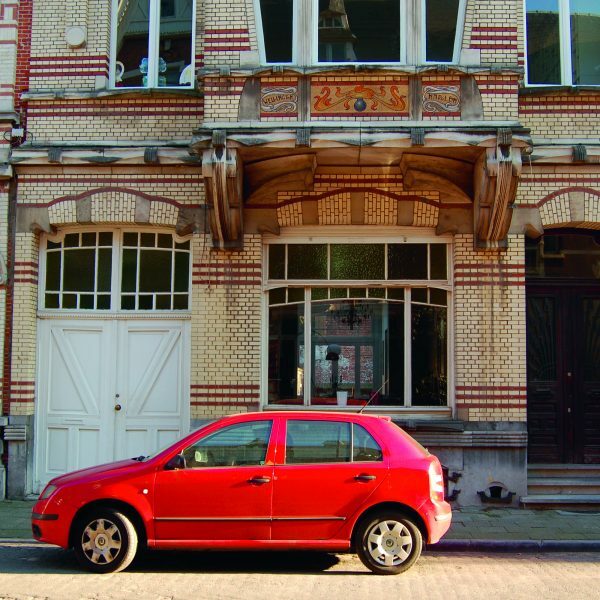 The community — including residents and merchant owners — wanted the neighbourhood to maintain its character and uniqueness while also supporting all modes of traffic, especially pedestrians. When the community had concerns over the corridor design models, the team had technical data to back up their rationale for the designs but was also fexible with community input. Be efficient. The team made sure to meet goals of all current local policies: Livable Streets Initiative, Complete Streets Policy, Better Streets Policy and then Better Streets Plan. During construction and renovation phase, the Valencia project piggy-backed with another concurrent paving project, saving money on both sides. Don’t be afraid to push the envelope. With the solid support of hard traffc data, the non-engineers were able to convince the engineers of new and bold design elements that added to the ground level’s public realm. Everyone celebrates these details today. Everyone celebrates these details today. Not only is the street much more balanced (instead of a 70-30-ratio car space to pedestrian and cycling space, it’s now 50-50), the street also represents a more pedestrian scale. With added lighting, street furniture, new trees, and artistic details on the cement, the physical space is a pleasure to walk and experience. As a pedestrian, you can see everything much better: you can see cyclists, people, and especially the store fronts much better. Because the sidewalk is much less cluttered, the merchants now have gained real estate with their plinths; outdoor seating permits have dramatically increased on the street and ‘parklets’ – small parks or table and chairs taking up two parking spaces – are becoming popular as well. As a multidisciplinary team, the project impacted the way they thought about interagency collaboration. Everyone learned a lot throughout the process and everyone came out with a win. The experience was positive and their success will translate to future collaborations. Of course there were challenges from the start of the project. The corridor is extremely busy and the neighbourhood is diverse with people, land uses, and transportation needs. The community was very active in the design and comment processes. 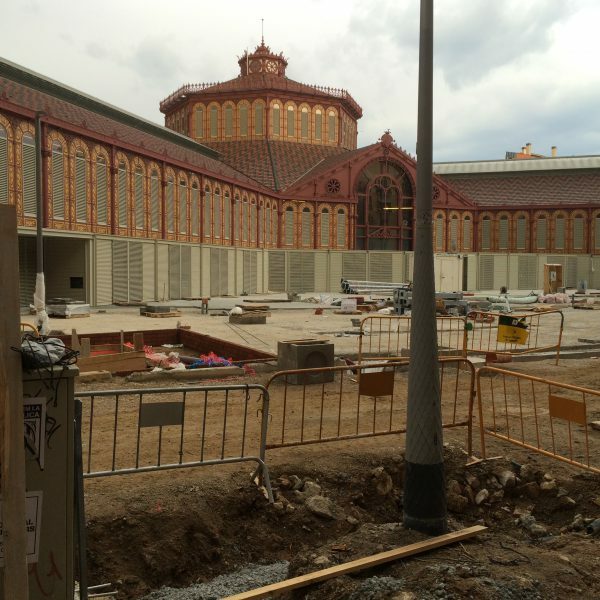 Despite the many challenges during the project—merchants upset during construction, technical issues underneath the street, and current maintenance challenges—the end result was a definite success. These four blocks of Valencia Street have been completely transformed into a pedestrian- and cyclist-friendly area. It’s now a place where people are welcomed to linger and experience the community life. Balance was an integral part of this ground floor transformation. The team balanced the needs of the community with their own expertise and experience with urban planning and traffic flow management. They also approached the design process with hard data to support their reasoning, but were flexible to the input of the community. Inter-agency collaboration was a success, and set a new bar for collaborative efforts in local and regional government.